They should score in 29 seconds in every game! After three points against Sunderland on Sunday, it's back to Europe for Arsenal, in a pivotal third game of the group stage against Marseille. Most agreed that one point was solid at Borussia Dortmund in the opening fixture and that picking up all nine points from the home games is necessary. So, where does that leave this match? Is a draw really enough in this one to still feel comfortable? Maybe comfortable in qualification, but probably not in winning the group. As it stands right now, Marseille has six points and Arsenal has four. From the way things look, a loss makes winning the group a stretch for Arsenal, they'd be down in the group 9-4, five points adrift of Marseille with only nine left to pick up. An Arsenal win (do I really need to explicitly tell you this is the best case scenario? I hope not) puts them on top of Group F by a 7-6 margin. But is a draw enough? They'll be behind Marseille 7-5, with Dortmund likely right behind. Coming out of Marseille with a draw means they can still gain the upper hand in the group with a win at the Emirates on Matchday 4 against the same opponent. But there's more pressure on later games, even with them being played at home. It's like a new signing! Photo: Guardian. 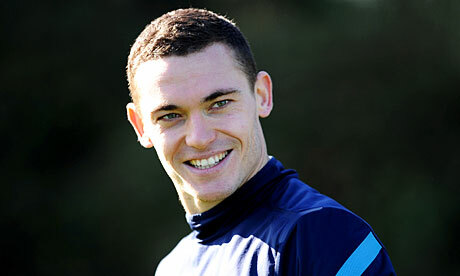 The best news of the week so far has come in the form of Thomas Vermaelen signing a new long-term deal with the club. The negative news to balance that out comes in the form of Kieran Gibbs's stomach injury, which will cause him to miss about two weeks. While Vermaelen might be back in time to face Chelsea on the 29th, Kieran Gibbs may not. Best of luck settling in, Andre Santos. With all of these injuries, Arsenal are currently without three of their top choice defenders, though they will be able to use the same back four that played the final 45 minutes against Sunderland at the weekend. It's yet another big test for Carl Jenkinson, and that test is really just getting started with Bacary Sagna out for so long. Aaron Ramsey is fit to return to the line-up, after being rested at the weekend with a hamstring problem. There's no other injuries in the side, other than the long-time injured. We're still at least a week away from a potential return of Abou Diaby, who might get a run out in the Carling Cup next Tuesday if he's fit enough. But, if he's not, I can't see him featuring before the next international break. Arsenal has no European suspensions; Arsene Wenger returns to the touchline after his absurd two match ban. Predicted XI: Szczesny, Jenkinson, Mertesacker, Koscielny, Santos, Song, Rosicky, Arteta, Gervinho, Walcott, van Persie. French domestic play. Photo: UEFA. Marseille picked up a big home result on Matchday 2, beating Borussia Dortmund 3-0, moving them clear to the top of Group F. Andre Ayew picked up a brace while Loic Remy scored the other. They will once again power Marseille's line-up as they attempt to make it three straight to open group play. They have yet to concede in the Champions League this year, having won their other match 1-0 at Olympiacos. There are only two injury concerns for Marseille, as Stephane Mbia has been out since August with a broken metatarsal in his foot. Djimi Traore has also missed the last four matches with a foot injury. Marseille will also be without two players due to suspension: Rod Fanni completes a two match ban for being sent off at Olympiacos while Jordan Ayew serves a one match ban for picking up two yellow cards against Dortmund on Matchday 2. Marseille has two wins from two matches in the Champions League this year, but have only picked up one win from ten domestic fixtures. They've beaten Olympiacos and Borussia Dortmund without conceding a goal, but their only win in Ligue 1 came against newly promoted Evian, 2-0. At home in Europe last year, Marseille lost their opening match against Spartak Moscow, then beat MSK Zilina and Chelsea before drawing against Manchester United in the Round of 16. The year before, Marseille lost twice at home in the group stage, against powerhouse sides AC Milan and Real Madrid. Manchester United in 1999. Photo: Daily Mail. This is the first meeting between Arsenal and Marseille, though Arsenal have never lost in France against French competition. The last time Arsenal faced a French side in France, they beat Auxerre 1-0 in 2002 (Auxerre, however, won the reverse fixture in London.) In eight total trips to France, Arsenal have won four of them and drawn three. The one loss was not to a French side; it was to Barcelona in the 2006 final in Paris. Against French competition all time, Arsenal have won seven of 14 matches, drawing five, and losing just two. Marseille are no stranger to English competition, even though they've never faced the Gunners. Last year, Marseille and Chelsea played in the same group. On Matchday 2, Marseille lost 2-0 at Stamford Bridge, but on Matchday 6, they won 1-0 at home. In the round of 16, they faced Manchester United, drew 0-0 at home in the first leg, then lost 2-1 at Old Trafford to crash out of the tournament. At home, all-time, Marseille have seven wins in ten matches against English competition. The only English side to win in Marseille is Liverpool, who did it in the group stages in 2007 and 2008.
but he was corrected by the fourth official. The referee is Damir Skomina of Slovenia. He's never worked an Arsenal match before, but he has been the referee for two prior Marseille matches: a 2-0 loss to PSV in 2008 and a 1-0 win over Zurich in 2009. He turned 35 in August and this is his 12th career Champions League match. This year, Skomina was the man in the middle for Manchester United's 1-1 draw at Benfica. Last season, he was the referee for the Inter Milan - Tottenham game where he sent off Heurelho Gomes after 8 minutes, Inter built up a 4-0 lead and started coasting, then Gareth Bale picked up a hat trick, which apparently made him the greatest player of all time in the eyes of the media even though his team lost. 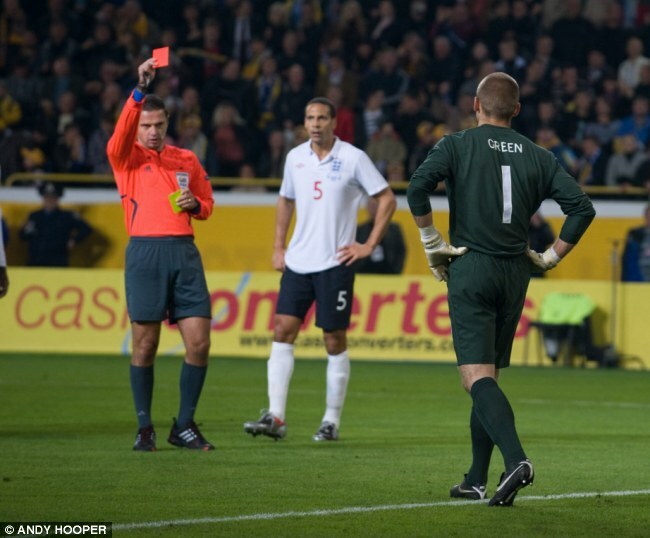 He was also in charge of England's 2-2 draw with Switzerland at Wembley in June. Fulham is the only English side to win a match involving Skomina as the referee; that came in the Europa League in 2010, a 2-1 win over Wolfsburg. The English national team has drawn three times and lost once with Skomina in the middle. Liverpool lost their lone match with Skomina as referee, 2-1 at Anfield to Fiorentina in 2009. In addition to Spurs' loss at the San Siro last year, they also drew Anderlecht in the UEFA Cup, 1-1, in 2007. The aforementioned 1-1 United draw at Benfica earlier this season closes the list of Skomina matches involving English sides. Nemanja Vidic sees red. Photo: Daily Mail. In Tuesday's results, both Manchester sides won their matches; City left it late but picked up a Sergio Aguero goal to beat Villarreal 2-1 at Eastlands, essentially saving their Champions League campaign for the time being. United needed two Wayne Rooney penalties to win in Bucharest, 2-0 over Otelul Galati. 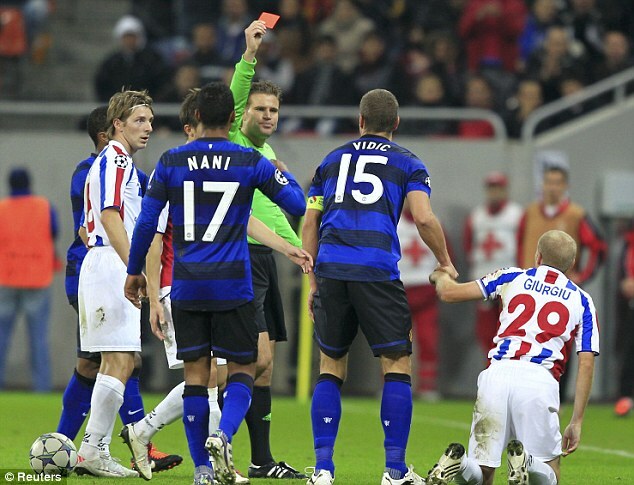 Nemanja Vidic was shown a harsh straight red card. In today's other Group F match, Olympiacos hosts Borussia Dortmund. Meanwhile, Chelsea hosting Genk, Zenit St. Petersburg heads to the Ukraine to face Shakhtar Donetsk, Bayer Leverkusen faces Valencia in Germany, Porto hosts APOEL, Milan welcomes BATE Borisov to the San Siro, and Barcelona hosts Plzen at Camp Nou.